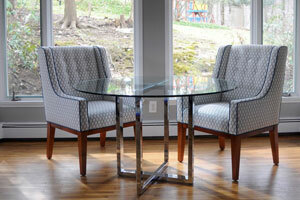 Alison Friedricks Interiors was hired to design and manage a project in Bedford, NY. THE PLAN: New Paint, carpeting, carpentry, stain floors, lighting, refresh bathrooms, add wallpaper, re-do closets, all new furniture for master bedroom, kitchen, family room. accessories, and had custom cabinetry built to accommodate the television.